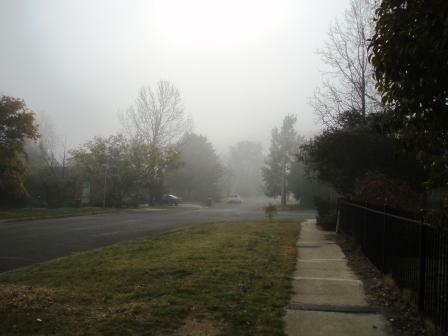 This morning was the coldest in the Berra for the year: -5.3 in town, according to the Met Bureau. Not so cold compared to some climates, but after a few years in balmy Slobart where close to the Derwent it never drops below zero, it was a novelty. I’m deeply grateful that, also unlike Slobart, rental houses in the Berra generally include heating. The street this morning was shrouded in mist, layered in frost. 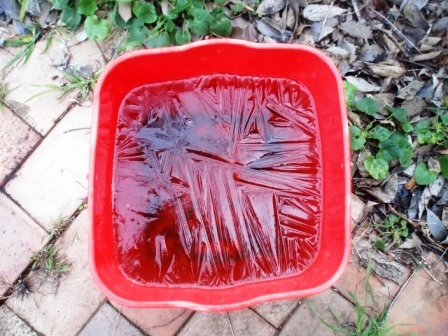 And I noticed a water bucket outside had frozen over, so I gave it a kick. Ouch. It wasn’t a thin crust of ice, but close to solid. We had reports this morning of people breaking door handles when getting into their cars to go to work. Black ice on suburban roads. Did you have the cold snap too?